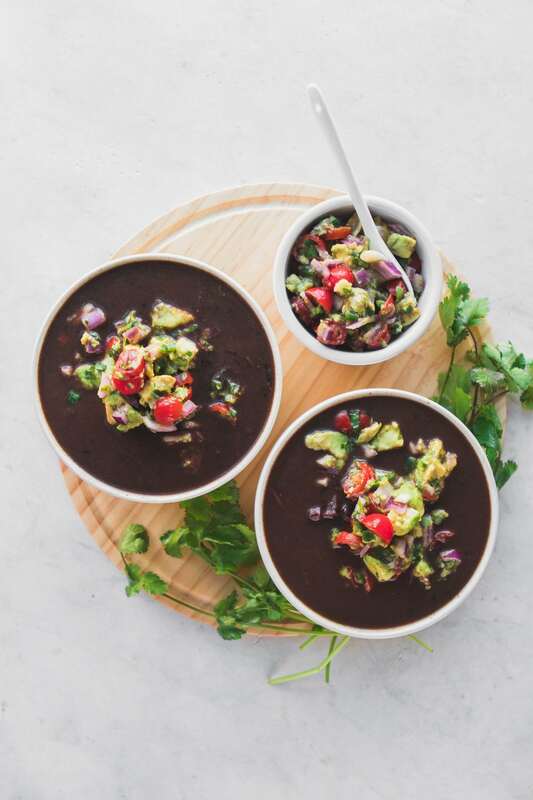 This Instant Pot Black Bean Soup is healthy, hearty, and easy to make! It’s perfect for Meal Prep and freezes well. All you need is 10 plant-based ingredients, an Instant Pot, and an empty stomach. While I don’t practice bean discrimination, I will say that I could probably eat Black Beans every day for the rest of my life and be perfectly happy. Especially if I can make this Black Bean Soup. With only 10 affordable ingredients + easy-to-follow instructions, you really can’t go wrong with this recipe either. Plus, you can *literally* make the entire thing in your Instant Pot (or similar Pressure Cooker). Minimal ingredients, minimal prep, and minimal dishes — three things I always like to hear. 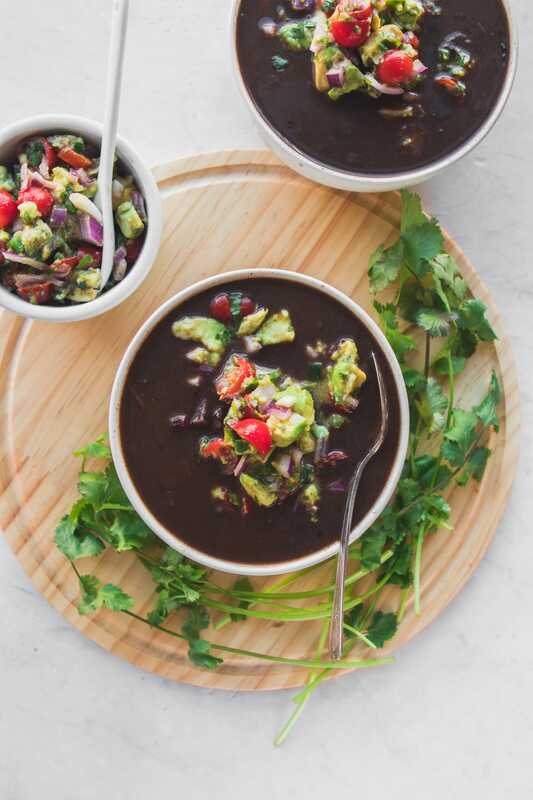 Whether you’re meal prepping for the week or just want something warm and cozy for dinner, this Instant Pot Black Bean soup is sure to satisfy. I love how you don’t have to soak your beans beforehand (less work = yay! ), PLUS how you can play with the final thickness of the soup just by adding/subtracting some liquid. 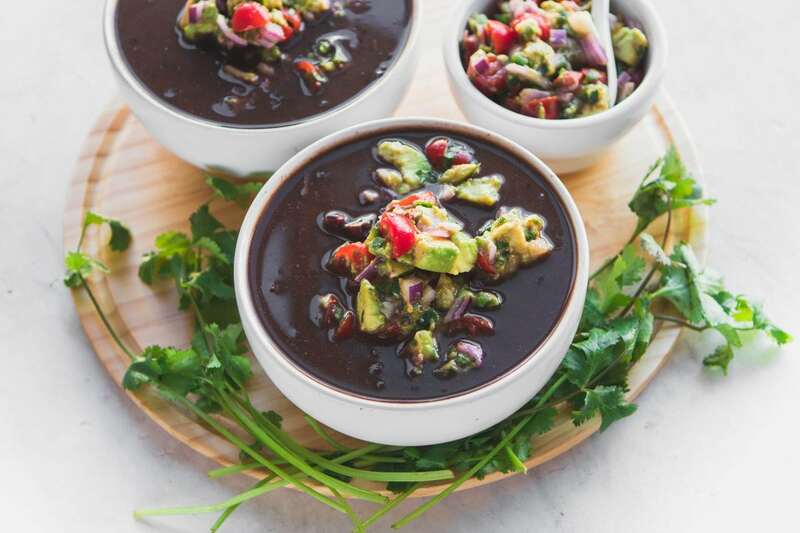 Do you add anything special to your Black Bean Soup? Let me know in the comments below, I’d love to hear about it! 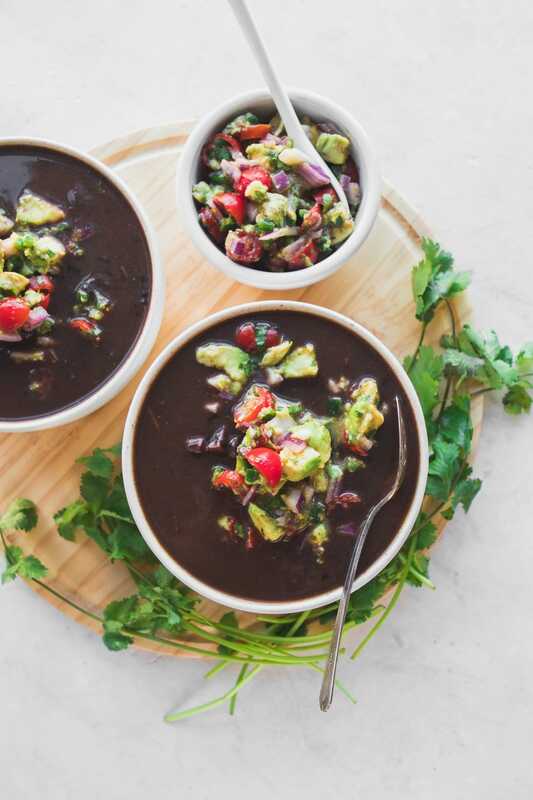 You can serve this soup on its own, but I would highly recommend topping it with some Easy Avocado Salsa! This soup freezes well — I like to make one big batch, and then freeze half of the recipe in individual portions so I can just thaw and heat up on a lazy day. Please see the recipe notes for stovetop instructions, if you don’t have an Instant Pot. If you’re looking for more Vegan Instant Pot recipes, you’ll also love this Sweet Potato, Red Lentil, and Peanut Stew, plus these Instant Pot Rice & Beans! First, add the Red Onion, Garlic, and diced Cilantro Stems into the Instant Pot with a splash of Water. Using the Sauté setting, cook the veggies for 2-3 minutes, or until translucent. Next, add the Red Pepper and spices to the Instant Pot, and sauté for an additional 1-2 minutes. Add the Dried Black Beans to the pot along with the Vegetable Broth. Stir well, then slowly add in Water to the iPot until the Water line is about 1” above the dried Beans. Cover and Seal the Pot, then set the pressure to Manual High for 30 Minutes. Force release the pressure from the iPot, and carefully blend the soup by using an Immersion Blender, or by transferring it to a blender. I blended about half of my soup so there would still be some texture to it. 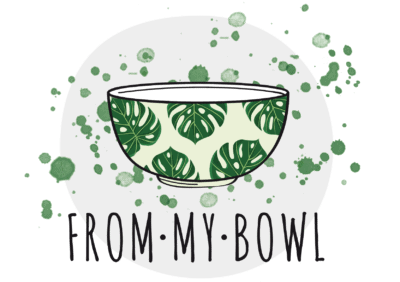 Pour into bowls, top as desired, and enjoy. If you would like your soup to be thicker, spoon off some of the liquid from the top of the beans once they finish cooking. This soup freezes well, so is perfect for meal prep! If you do not have an Instant Pot, you can also make this recipe on the stovetop – you will need to adjust the cooking time for the dried Beans, and may need to add in more Water as well. 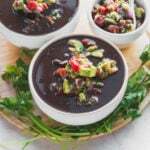 Alternatively, you can substitute 4 cups of drained & rinsed canned Black Beans for the dried Beans – if you do this, you will only need to simmer the mixture for 10-15 minutes or so before blending. Amazing, next on my meal prep! This looks wonderful. I just stumbled onto your posts and they all look great. Just wondering if it would be possible to post an estimate of the calories per serving? Hi! What do you do with the cilantro leaves? Are they just to use for topping when the soup is done? Yes! You can also save them for use in future recipes or salads. the lime juice and zest? when do they get added? Add the lime zest with the beans as they are cooking, and the lime juice at the end! I’m looking forward to making this recipe this weekend. I’m unsure about the ingredient “red pepper.” Do you mean a red chile pepper or a red bell pepper? This turned out great and most importantly, my husband, agreed that this recipe is a keeper! Thanks for sharing. Hi – looking forward to trying this in a couple of days. Quick question: I’m cooking for a crowd, so will likely need to double the recipe. Any guidance in that regard? Just a straight up doubling of all ingredients? How about changes to cook time? Thanks! If I was stuck on an island and could only eat one meal for the rest of my life, I think this would be it. This recipe was delicious, filling, healthy, and budget-friendly. I will definitely be adding this into our regular meal rotation! Was too lazy to do cilantro and I didn’t follow directions on the sauteing part (I have never used the saute function before… and I didn’t read very well… so my fault not yours 😛 ) but it came out amazing! I’m SO happy to be eating this. Made it in a 3qt pot just fine. Blended the majority of the beans and oh my lanta is it delicious. Thank you!!! Glad to hear it was still a success! So delicious. I made a food network version, which was so bland. But this version was full of flavor and delicious! Thank you! This was awesome! I added a can of sweet corn. I made this today and loved it! Since I didn’t have all the spices, I used just the salt, cumin and taco seasoning mix and no lime juice. After it was cooked and mixed, I added Toffuti sour cream guacamole and mixed it a little bit into the bowl of soup. Wow, wonderful. Even my husband, who only eats meat, said it smelled so good when he got home. I want to try this but I don’t have a instant pot I can do stove top but was wondering if it would work in a crock pot? I haven’t tested it in a crock pot but I imagine it would work! We made this recipe without the Chili powder bc. we are not too much into the heat. We did add 8 oz. thick cut bacon that I sautéed for 6 minutes then I proceed with the recipe as is. It was delicious and it was the very first recipe we ever made in the instant pot. I will be making again as we love it.